My husband and I have been talking about me making this for longer than I can remember. So today is the day. It is simple to make, yet it does take a little time. However, most of that time is hands off. The oven is doing all the work, which is okay with me. The recipe generously serves four. That means we will have leftovers for lunch tomorrow. Combine all the ingredients in a large bowl and whisk together. Dip cauliflower into gravy mixture until it is thoroughly coated. Note: I let the cauliflower head marinate in the gravy mixture while I cut up the other veggies. 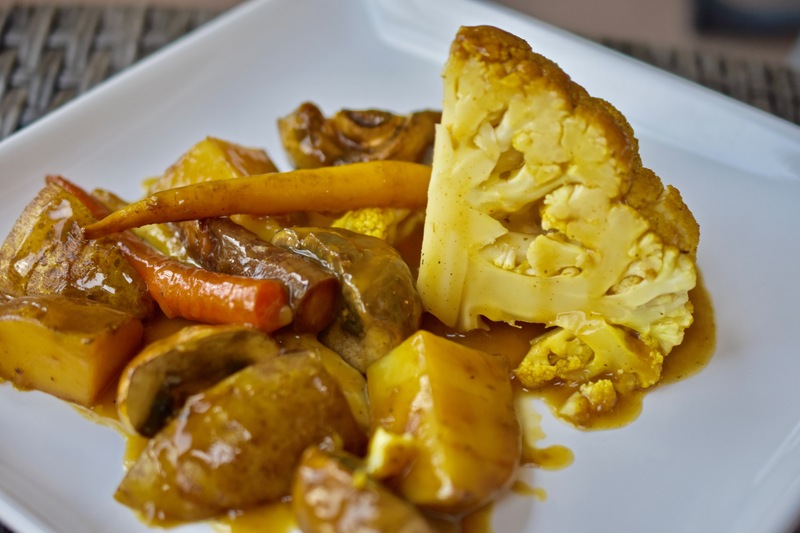 In a large baking dish or cast iron skillet arrange the cauliflower in the center and the remaining veggies around the cauliflower. Pour vegetable broth over carrots and potatoes. This will help the veggies steam. Pour half the gravy over all the ingredients. Cover baking dish and bake for 40 minutes. This is my kind of dish and it sounds really tasty. I’ll have to give it a go. It was so delicious. My omnivore husband loved it. The gravy was oh so good. Thanks for stopping by. Thanks. It was delicious. Thanks for stopping by.